In a small square box in the middle of the screen, black and white images play. Men walk and march erratically as in early Buster Keaton and Charlie Chaplin movies. We hear a soundtrack taken from diaries and archive recordings. 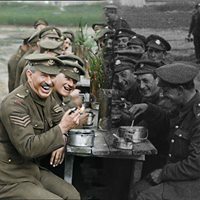 In a moment the screen widens, the picture gains life-like colour, and it is as if the world of the First World War has emerged into our current consciousness. 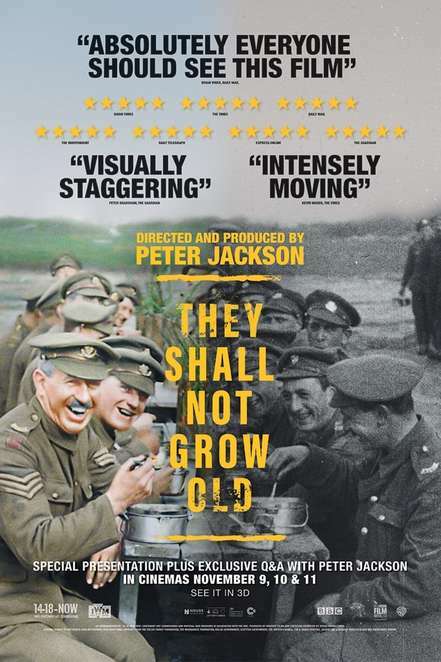 Many reviews take a geekish pleasure in explaining just how Peter Jackson transformed 100 hours of film and 600 hours of audio into the unforgettable immediacy of the impact of war that is They Shall Not Grow Old. Suffice it to say that the gargantuan task produces a movie that is surely a timeless classic and provides a template for others to bring archives to life. The men (and not surprisingly, it mostly is men) become engaging, real personalities, extraordinary in a sense because of their matter-of-fact approach to describing what their war was like, from the nudge-nudge acceptance of under-age enlistment, the totally unrealistic expectations of the new recruits, to the day to day drudgery, humour and horror of a war where machinery has far outpaced the capacity of men and their leaders to understand and to use it. We are in the trenches with them, with their amalgam of the human, the humorous and the horrific. Jackson does not need to dramatise the stories – in the low-key, understated narrative lies more than enough pathos and drama. We watch German prisoners of war volunteer to be stretcher-bearers for their erstwhile enemy soldiers and the matter of fact way that our narrators accept this. In the midst of the camaraderie and the carnage, the narrators and the images bring to life the warmth and humanity of the men. This movie never seems to be trying to be either a glorification of war or an anti-war propaganda piece. The men, the carnage and the images are allowed to speak for themselves. They Shall Not Grow Old – (the actual line from Laurence Binyon's poem) has often been seen as commemorating the mortality and the immortality of very young men whose lives were cut short and whose memory lingers on. Jackson has taken ageing audio and video footage and revitalised it in an unforgettable way, to bring their memories to life. There are some movies that become part of our shared memory-bank. They Shall Not Grow Old, in my opinion, is destined to be one of them. This is not just a good movie, it is a great one.